Every business needs content. Not the bland, me-too nonsense that frequently clutters up our inboxes and feeds, but genuinely useful, interesting content. Content that helps a business stand out amid the clutter and noise. Content that moves prospects closer to a sale. Content that can become a powerful differentiator for your company. And businesses often have a tough time finding the writers who know how to create that type of content over time. One of the reasons I think organizations struggle is that they don’t always know what qualities will make for a genuinely productive, profitable hire. And as you might guess, I have a few strong opinions about that. So, here’s what I think you should look for when you need to hire a content professional to create the marketing that will move your business forward. A strong, confident writing voice is essential. Strategy, marketing, and persuasion techniques can be taught (that’s what we’re here for). Voice, on the other hand, develops over time and needs to come from within a creative, intelligent, sensitive human being. While a solid writing voice can be developed over time (here’s how), your writer won’t ever get there without a lot of passion and commitment. Talent doesn’t hurt, either. Unless you have the bandwidth to add a content editor to your team, your writer needs to have a solid grasp of usage, spelling, and all those mundane issues that can make us look silly when we get them wrong. Your writing candidates should get their feathers ruffled when someone uses it’s for its. Every writer occasionally makes a typo — but for a professional, that should be rare. Well-crafted content is important — but if it’s not wrapped up in a fascinating package, it probably won’t get read or shared. A pro knows how to deliver the usefulness that audiences need, but also wraps it up in unusual hooks and angles that will capture attention and engage curiosity. There are plenty of writers out there who can write a pleasing sentence or paragraph. But a content professional also understands how content can move prospects smoothly down the path from stranger to interested prospect to delighted customer. She understands headlines and why content gets shared. She knows what type of content works well in blog posts and what’s better saved for a landing page or an email message. If you have a writer working for you, that person should be able to tell you precisely why she’s taken a particular angle with a blog post, video script, or white paper. She can explain how your content program ties into your search strategy and why she’s using the number 8.4 in the headline, rather than rounding it up to 9. Give her a chance and she’ll talk your ear off about the structure of bullet point fascinations, benefits over features, and the call to action. The people who revel in this stuff are the ones who create compelling marketing content that builds your business. Whether or not you find it exciting, your writer needs to. She needs to be able to tell you why, so your entire organization moves in the same direction. If content is important to your business, you need a professional, not an interested amateur. And one of the hallmarks of the professional is commitment. Commitment to getting better over time, to staying on top of developments in the field, to a lifetime of learning. Raw talent to write is important, and an understanding of strategy is important. But you also want to find someone who takes the profession seriously — as a profession — and continues to sharpen and refine his skills. From search algorithms to social platforms to what types of headlines are performing well these days — professional writers need to stay plugged in to what’s changing in our profession. A serious content professional also takes the initiative to become an authority in the topics he writes about. He interviews experts (some of whom might be within your company), performs independent research, pores over industry journals, and talks with customers. You can find that level of dedication in a freelancer who specializes in your industry, or you can build a long-term relationship with a strong content generalist who takes the time to develop that depth of knowledge about your individual company. What you don’t want is a pennies-a-word person from one of the cheap freelance sites. They simply can’t make the commitment to learning your topic the way a true pro can. Where do you find these content professionals? I cheated when I wrote this post — because I went to the guidelines for our Certified Content Marketer application evaluations. These are the qualities we look for when we’re assessing the work of writers seeking our Certification — and these are the qualities you’ll find in the writers who earn that badge. We have a whole page dedicated to them — some serving specific niches like real estate or healthcare, and others who write across several industries. We look for the qualities I talked about above: a great writing voice — first and foremost — paired with strategy, professionalism, and straight-up marketing chops. If you’re looking for a serious content professional, this is where you’ll find her or him. But don’t wait too long. 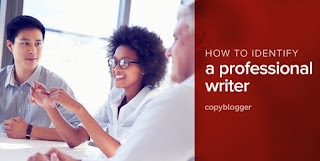 The perfect writer for your business would love to get started making your content program more successful … don’t let her slip away to some other company.